Breakfast with Bear, a new song-filled hosted hour for preschoolers, will illustrate the benefits of healthy living as Bear, the 7-foot tall star of the Emmy Award-winning series Bear in the Big Blue House, pays visits to real homes in cities throughout the country. Each weekday morning, Bear will be seen greeting a preschooler and his or her family, interacting with them as they go about the daily routines children age 2-5 are mastering, including brushing teeth, making wardrobe choices and getting dressed, tying shoes, stretching, getting the body moving and eating a healthy breakfast. The announcement was made today by Gary Marsh, Executive Vice President, Original Programming and Production, Disney ABC Cable Networks Group. The Breakfast with Bear hour, featuring highlights from those visits during programming interstitials, will premiere in June during the learning-based programming block for preschoolers on Disney Channel. Production begins next month in cities to be announced soon. In making the announcement Marsh said, "Preschoolers and parents have come to depend on Bear to help decipher the world around them and he's a trusted source for reinforcing the message about good nutrition, healthy habits and age appropriate activity, but from Bear, it's not presented as a lesson, rather a wonderful learning experience where warmth and affection stands out." 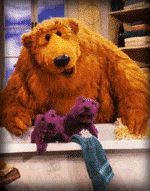 Bear of Bear in the Big Blue House is a top 10 character with moms of kids age 2-5. In addition, the series has strong awareness, 84%, among preschool moms (Source: Marketing Evaluations, Cartoon Q Study, Fall 2004). Breakfast with Bear will bring Bear on a visit outside his Woodland Valley surroundings for the first time. Bear is like no other bear. With shaggy orange fur, his friendly smile and intimate manner engages little children as he speaks directly to them, while his inquisitive style encourages them to join in, play along, verbally interact and use their imaginations. Filled with civility and concern, Bear also loves to help his friends, constantly displaying infinite patience and interest in their activities. Breakfast with Bear is the first new entertainment initiative launched by the Muppet Holding Company. Along with Breakfast with Bear, the brand will be supported with additional initiatives, including Internet content, live theatre shows, and a new merchandise rollout. 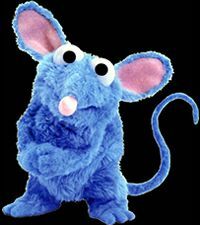 The character and the series Bear in the Big Blue House were created by Emmy Award-winner Mitchell Kreigman and produced by Jim Henson Productions.